As all knew Kamal Hassan has lot of fan base among the Southern TamilNadu because of his films Devarmahan and Sandiyar. 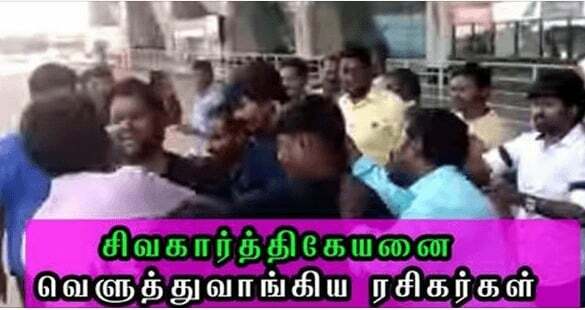 This morning Sivakarthikeyan and Kamal Hassan went to madurai on same plane and Kamal Hassan’s fans were eagerly waiting outside the airport to welcome him. After Kamal Hassan left and Shiva arrived , the Kamal fans there started attacking him , this was captured by some of them there. Shiva still remained silent when asked about this ! This video went viral in social media and many suggested that this seems like a planned one and Kamal may be responsible for this. And also the reason that was said is , Shiva only uses Rajini Movie titles for his film and as all knew Shiva is a die Hard Rajini fan !